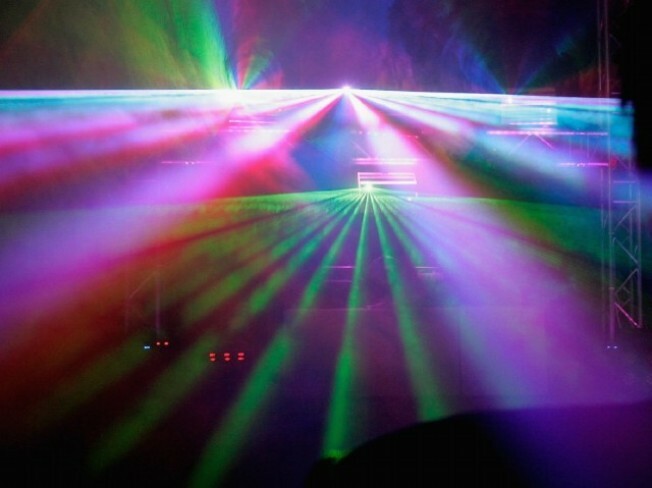 Enjoy dinner and a laser, via the Dining in the Light program at the Laserium in Hollywood. Dining in the Light: You like laser light shows. The twirls, the colors, the louded-up FM ballads testing the speaker system. You also like eating out, trying new places without spending a ton. Dining in the Light makes both things happen. Who's doing it:The Laserium in Hollywood. It's been open, oh. Since the start of summer. And rocking socks and/or other footwear off with old-school laser spectaculars. The Dining in the Light deal: Make a reservation at one of the nearby restaurants listed at the Laserium site. Eateries include Loteria (on Hollywood), Kitchen 24, Kung Pao Kitty, plus a handful of others. Mention you're attending Laserium when you speak with the host, and then, after your Laserium show, show the restaurant your stub. What the stub-showing will get you: Twenty percent sliced off your bill. Sliced like a powerful illuminated beam slicing the air. Wait. What do I need to do again?It's all right here. Strange magic: An ELO cover band is heading for the Laserium next spring. That, plus a discounted dinner, is truly Mr. Blue Sky indeed.